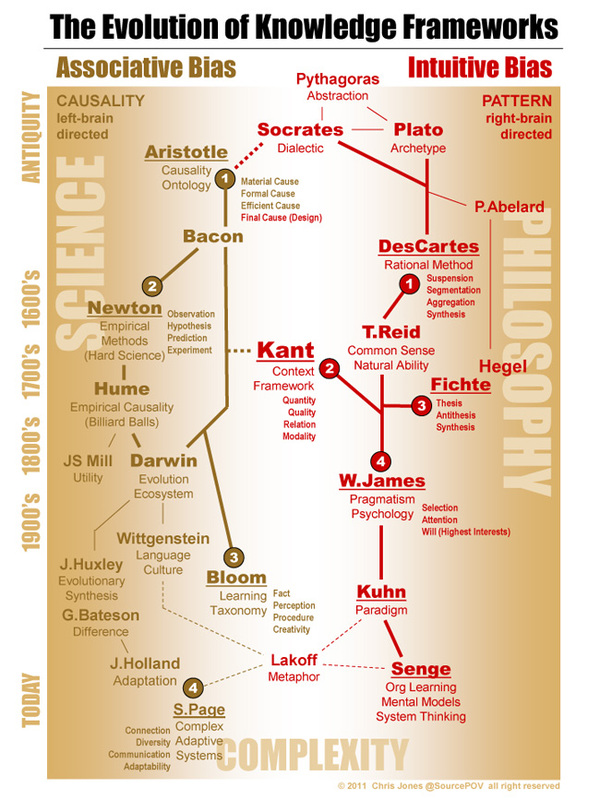 The Divergence of Thought in Science & Philosophy: Could “Complexity” be New Common Ground? Knowledge is a gift best appreciated when we don’t try to think about it. As a topic of focus, it frequently defies words. It grows more elusive as we attempt to draw closer to its source. And, though we make complex decisions every day, we routinely fail to grasp what it means to truly understand something. For many reasons (outlined elsewhere in this thread) we fail to engage what’s presented in a discerning way. My research on critical thinking is making one fact crystal clear: it’s high time we raised the bar on how well, and how deeply, we dare to think. An epistemology is a holistic framework for knowledge, giving us a set of consistent, simple rules for how we should describe that knowledge and apply it in practice. Looking back over the centuries, 8 famous epistemologies dating to Aristotle, Bacon and DesCartes mark clear fault lines between science and philosophy. It is a separation between those who think in terms of empirical ’cause and effect’ vs. those who tend to think more intuitively, in ‘patterns’. Both modes of thinking have, in the long run, proven fertile. The problem that developed was an all-or-none orientation. The rift was widest during the 19th century, as Hegel and Mill battled for mind share. In the wake of this, sadly, a long standing respect among academic schools of thought was all but gone. And the lingering cultural effects continue to impede progress across many domains, ranging from business to government to public education. In the 21st century, we can only look back at the damage that’s been done, and ask “why”? Our left brain is our associative center, the home of “cause and effect” thinking, the place where we focus and categorize and label every detail. It is where we refine what we already know. Think science. Think public education. Our right brain is the hub of our pattern matching capability, where we seek new information that arrives in diverse or unfamiliar forms; it’s where we scan the environment, search for clues, and try to relate ourselves to the world around us. Think philosophy. Think ethics. Think culture. It would appear that key thinkers of our time, and whole schools of thought that emerged under their guidance, have a strong bias in their cognitive models. Perhaps it’s not surprising then that the pursuit of knowledge over the last 2,500 years has been split into two camps: the left brain camp of empirical science, and the right brain camp of the intuitive philosopher. Thanks to the industrial revolution, science has generally won most of the debates. Philosophy has not fared well, losing anything resembling critical mass. But all that can change, and I do think there’s hope. Rather than argue the point, I’ve shown the two divergent branches of knowledge in the graphic, above. I’ve identified 4 leading thinkers and their knowledge frameworks aka epistemologies in each branch. As we near the present day, you’ll notice fewer discrete frameworks, and a dearth of contributions from the philosophical ranks. But there’s also a convergence of sorts. The real world lies in the middle, balanced, as it were, between two cognitive extremes that, by themselves, cannot describe our reality in a holistic way. We need both halves of our brains to function. To reason. To imagine. To understand. As I was finalizing the graphic that helped me bring this post to words, I came across an intensely fascinating, and highly relevant TED talk by Iain McGilchrist. Thanks to Jennifer Sertl for teeing it up on G+. I’m seeing a harmony of thinking made possible when a greater share of our left-brain and right-brain mental resources are tapped. There is much negative thinking to undo; we must move outside some exceedingly strong professional paradigms. But as we do, I see us replacing conflict and stalemate with a genuine hope for new possibilities. I openly wonder what might happen when we embrace empirical facts and rational insights in their full, raw, hopelessly unrealized potential. Stephen Johnson says great ideas come from other great ideas. So it’s time .. high time .. we get scientists and philosophers talking again. There will be a richness in the diversity of their epistemologies that will foster the new ideas we need. New epistemological frameworks for complexity. New common ground for a world that is hopelessly in need of it. A fundamental rethinking of how we frame public education. For the scientists needing proof? Look no further than the K12 Ecosys. Pencils down, folks. Let the deep conversations begin again. As historians are quick to point out, the parallels between modern times and the classical world – including not only Greece, but also Rome – are plentiful. No new thinking here. In profound ways, our modern society, laws, forms of government and language are embedded in the classic traditions. The history of philosophy, more broadly framed as the history ideas, tells a compelling story about a journey to new levels of understanding – a tale that traces evolution of ‘critical thinking’ itself. At its core, philosophy is about learning how we ‘know’ what we know, and learning what we can do with the knowledge that can be gained. There is scant space here to do justice to such a rich history, but to advance the topic as part of my critical thinking series we need to at least expose the biggest pillars. 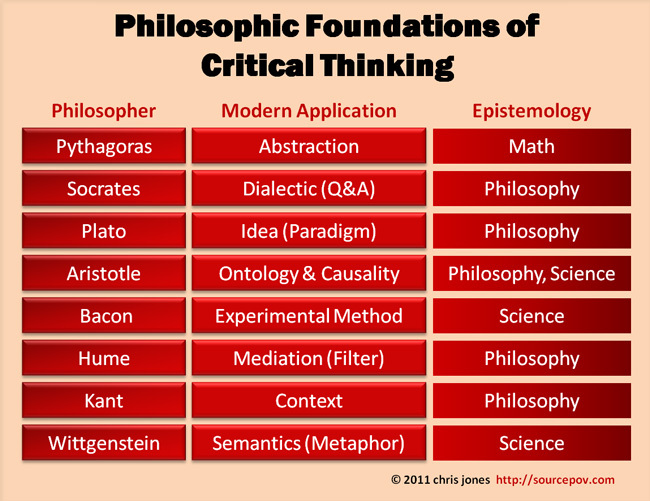 In the paragraphs below, I focus on philosophers who have provided significant contributions to what has evolved as the modern notion of critical thinking. Pythagoras. A pioneer in math, Pythagoras advanced geometry with his famous theorem on triangles. In so doing, he brought the concept of ‘abstraction’ into the mainstream. He effectively demonstrated that what we observe is one thing, while what we comprehend mentally is quite another. Socrates. Famous for asking deeper and deeper questions to get to the core of an issue, Socrates was a relentless advocate of critical thinking. He is said to have used Pythagorean triangles drawn in the sand to challenge skeptics on their limited view of the ‘knowable’. Plato. While famous as both student and scribe of Socrates and an early political scientist, Plato was important in this discussion for driving concepts of perfected universals – truth, as one example – derived from accepted perfections in abstract mathematics. When we think about ideal solutions and archetypes, we owe a debt to Plato for asserting their importance, laying ground work for the modern framing of ‘paradigm’ (Kuhn) and ‘mental model’ (Senge). Aristotle. A critical inflection point in Western philosophic thought, Aristotle used his deep appreciation for observable science – biology in particular – to bring a rational, logical rigor to the abstract ideas of his time. He laid key foundational ideas of ‘causality’, and described abstract universals as characteristics that describe what we see in reality, reversing ideas of his predecessor, Plato. He was also the first rigorous ‘ontologist’ – developing categorization structures (including the classic genus-species taxonomy for plants and animals) that help us classify the world around us. Bacon. While not the first in a long empirical tradition, Francis Bacon is typically held up as the earliest catalyst of rigorous thought that established experimental science as a discipline. He provided the building blocks of what would later become known as the scientific method. With this structured approach, man gained the ability to discover and prove the causes of things. Hume. Among his many contributions, Hume helped advance the idea of ‘mediation’ in our perceptions, arguing that our logic and conclusions are often filtered, whether by our senses or by our prior patterns of behavior, describing how the mind makes assumptions around causation based on our experiences (note: watch for future discussion of ‘mental heuristics’). Kant. Perhaps the most influential critical thinker of the last 400 years and a rich source of insights, Immanuel Kant brought many of Aristotle’s early notions forward into the modern world. He advanced the categorization of knowledge, with ideas that hinted at ‘context’ based on the notion of “a priori” (pre-existing) factors such as the special external functions of space and time. He also introduced a rational approach to our behavior, bringing logical underpinning to the discussion of ethics. Wittgenstein. Famous for bringing the nuances of language into the discussion of ideas, Wittgenstein argued that both culture and semantic bias carry a fundamental influence in any kind of meaningful exchange. He argued that semantic rigor is essential to philosophical endeavors, serving as a cornerstone of what we now call critical thinking. At the risk of leaving holes in our story, I’ve left out some key names – deep thinkers like Descartes, Hegel, Locke, Hobbes, Reid, Mill, and a raft of others – and I’ll take responsibility for the exclusions. This was in part due to space, but also due to the focus of my research on the dynamics and demands of modern collaboration. If you can help me fill any gaps in the progression, share your thoughts and I’ll provide updates. There’s also a quick survey in the toolbar that would help build a broader consensus on those most influential. With a foundation in place, where can we go from here? Unlike any time in history, people and their ideas are getting connected at an accelerated rate. That changes the rules of what’s possible. 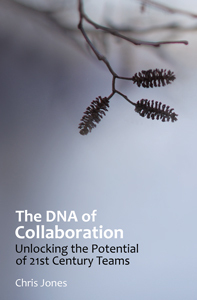 Critical thinkers who collaborate are likely to drive a potent set of outcomes. The ability to realize the new dynamics of knowledge sharing may be the next significant challenge our society faces, but also, I believe, it is our greatest promise. Building a sustainable future requires that we relearn what it means to learn, and to advance our ability to learn from each other – globally, deeply, and ever more quickly. There’s still much work ahead, as this series continues to rediscover what scholars have known all along: the importance of critical thinking.